Hey everyone! I can’t believe it’s almost Thanksgiving! These last few weeks have certainly flown by! We’ve been busy on the farm getting ready for winter, we’ve only had a dusting of snow so far. I thought it was pretty neat to play in! With the holidays approaching I thought this would be a good time to talk about my favorite subject-milk. There’s so many different kinds of “milk”out there nowadays and a lot of unfounded fear in the good wholesome product my herdmates make. There’s a lot of reasons people may give for not drinking milk like “we are the only species who drinks another animals milk”. But my farmer mom tells me the cat, dogs, chickens and pig all love their cows milk!! Some other people may say that cows are treated unkindly or spend all day long getting milked. Our farmers treat us girls with the utmost respect, making sure we have the best feed and all we want of it, and that we are comfortable, happy and healthy. If any of those things is missing from the equation, we won’t give the quality or quantity milk that is our potential. My farm mom says cows actually have it really easy because they only are getting milked 2-3 times a day for about 10 minutes at a time. She said that is nothing compared to a baby cluster feeding or going through a growth spurt!! She said she could sit there for hours with the baby nursing!! Bet she wishes she was a cow sometimes! The milk you buy from the store is fresh. Let’s take our milk for example. Our truck driver comes to pick up our milk every day. That means every day that milk is going to the plant. Some larger farms even have trucks pickup a couple times a day! That mean that milk is getting from cow to you in a matter of days. Not too bad. Also, the only ingredients in milk are milk and vitamins. That’s especially to make sure your little kiddos drinking the yummy stuff get all the nutrients they need right there. Whole fat cows milk is recommended for growing kiddos because the fat and protein are crucial for brain development, as well as all that calcium, and with the added vitamins, they are all set to be the super heroes they are destined for! So what is it that people don’t like about milk? If cows are treated great and it’s the healthiest choice out there, what gives? Well I’m not to sure exactly. I know us babies definitely love it! Maybe it’s the hormones? 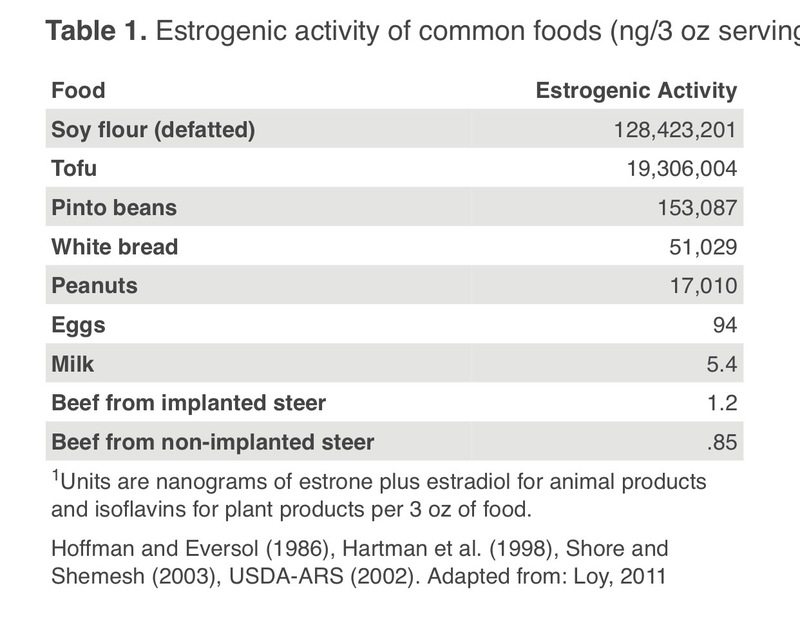 There are naturally occurring hormones in milk, but as you can see in the chart below (taken from Igrow.org) the amount of hormones in milk is pretty insignificant compared to other foods you eat. What about supplementing with rBST? There is absolutely no evidence that this has any affect on your milk or you, there is no difference in milk with it or without. But because we live in a society where the consumer is always right, and the populous decided they did not want dairy supplemented with rBST, most co-ops have told their farmers they have to stop using it. Like I said, it is completely safe but people didn’t want it used so it’s not. Contrary to some recent “documentaries” there is no evidence that rBST or the naturally occurring hormones cause early puberty or cancer or any other disease. We’ll talk more about this at a later date but if someone is using scare tactics to make you believe something (especially without evidence!) it’s probably not true. I could easily say that there are no studies proving that drinking milk won’t give you pink polkadots, but that doesn’t mean it does! It’s all in the wording. So if you’re worried about hormones in milk, I wouldn’t worry at all. So what else is there that people would worry about? Ah yes…antibiotics. Let’s talk about this. Sometimes us cows get sick. Although our farmers do everything they can to keep us healthy, sometimes it just happens. Let’s say one of the girls gets mastitis. My farm mom has had it a couple times and she said it was worse than labor. Pretty painful stuff we’re talking about. But with some antibiotics in her system and some rest, she said she was good to go and back on her feet pretty quickly. So what happens if a cow gets mastitis? Well, they are generally treated with antibiotics that are administered into the quarter (cows have 4 teats so each one is called a quarter) that is infected. In almost all places that cow gets plastic red leg bands and she is put in a different section of that barn. In some places it could be a few stalls that are separate or in our case, it’s an open part of that barn right off that parlor with straw to lay on in a pack setting, instead of stalls. These areas are called sick pens or hospital cows. This would be for cows that are treated with antibiotics, any cows that have had a calf in the past few days or maybe someone who isn’t quite sick but isn’t quite right and just needs some extra attention. These sick pens are generally located right next to the milking parlor for a few reasons. One is the cows won’t have far to go to get milked.If you don’t feel good you don’t want to go to work so we keep them close. Also they are by the parlor because that’s a busy place, with people walking by all the time. This way the cows are being looked at all day long. The pack that houses the cows getting ready to calve is generally near there too. You can see the bright red leg bands (pretty hard to miss right?) and the bucket hooked up to catch her milk. Her milk will continue to go into that bucket until not only is she done getting antibiotics but past that, until all residue has cleared from her milk. Farmers have this nifty little tool that they use to test to make sure the milk has no residue in it, and once that happens and she’s feeling better, the leg bands come off and she goes back to live with her buddies in the barn. But can there ever be antibiotics in your milk? I mean what happens if she loses her leg band? 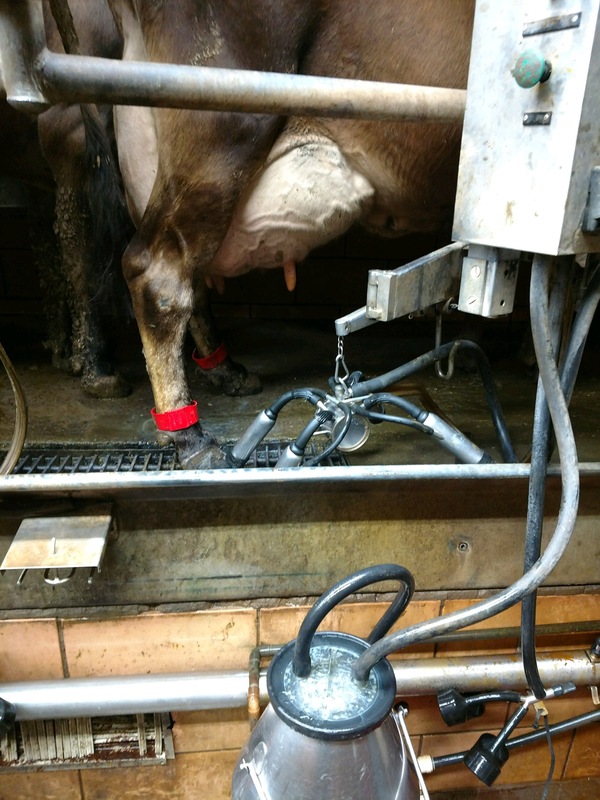 What happens if the bucket milker doesn’t get hooked up? What if that milk goes into the tank? 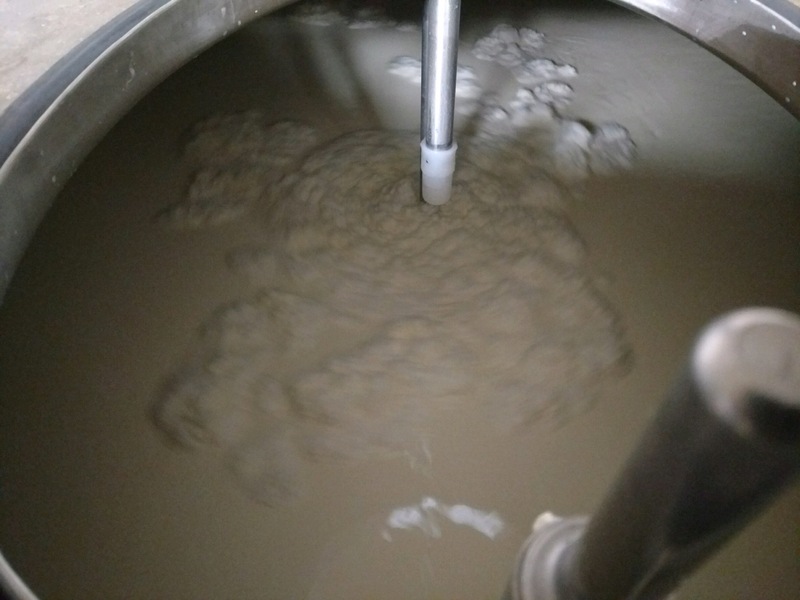 At every single farm, on every single load across the US, every time a milk truck driver comes to pick up the milk he takes a sample of the tank. Every. Single. Time. Every. Single. Farm. When he gets to the plant, he may only have one farms milk on his truck or he may have several. Before he unloads any milk, a sample is run from his tanker. If that sample is negative for antibiotics, he is allowed to proceed into the plant and unload the milk. If it comes back positive, he has to leave and get rid of the milk and thoroughly wash his truck before picking up milk again. Then all the samples of milk from that truck are run to see who has the “bad” milk. If it is you, you will be held responsible for all the milk on that truck. Most co-ops also have a rule about how many times this can happen before you’re not allowed to ship milk anymore. So no milk that has antibiotics is ever even allowed near the plant, let alone your glass. So you see that there is never a chance of antibiotics in your milk. I hope that this talk we had cleared up any questions you may have had. I would hate to think with the holidays coming (or really any day I guess!) that you would be missing out on all good things dairy out of fear of what was going in your mouth. So fear not and gobble down the whip cream on the pie, slather on the extra butter on your biscuit and get that extra cheese pizza to watch the game with on Sunday. And then wash it all down with a glass of milk and know your body is thanking you for all that dairy goodness. Hey everyone! It finally stopped raining!!! Yay! I thought for a minute us bovines would have trade in our fur for fins! Last time we talked, I explained about how much I love my house (and why it’s important that I’m there). I have to tell you, even through the 3+ inches of rain these past few days, I was nice and cozy and dry! My farmers kept giving me fluffy straw and although I didn’t get to play out in my yard too much, it was nice not to be wet! You see, us cows don’t like the rain so much. Let’s talk a little bit about cows and weather. The big cows and older heifers (those are females who haven’t had a baby yet) are housed in what’s called a free stall barn. That means there’s a few rows of stalls and the cows are free to come and go as they please. The big girls get milked twice a day, and they’re only in the parlor for about 10 minutes at a time, so the other 23 hours and 40 minutes is up to them. Anyways, in the barn is feed, water, stalls full of lots of sand (I hear it’s like lying on the beach all day!) and there’s even a back scratcher. And us cows, being the social butterflies that we are (especially us jerseys!!!) spend a lot of the day walking around and visiting with our friends. Most of us by the time we get to the big barn have a group of friends we have known since birth and we hang around with them. It’s kind of like that best friend you’ve had since kindergarten going away to college with you. So why are us cows living in a barn instead of outside? Well, because weather. Like I said, it has started raining and not stopped. 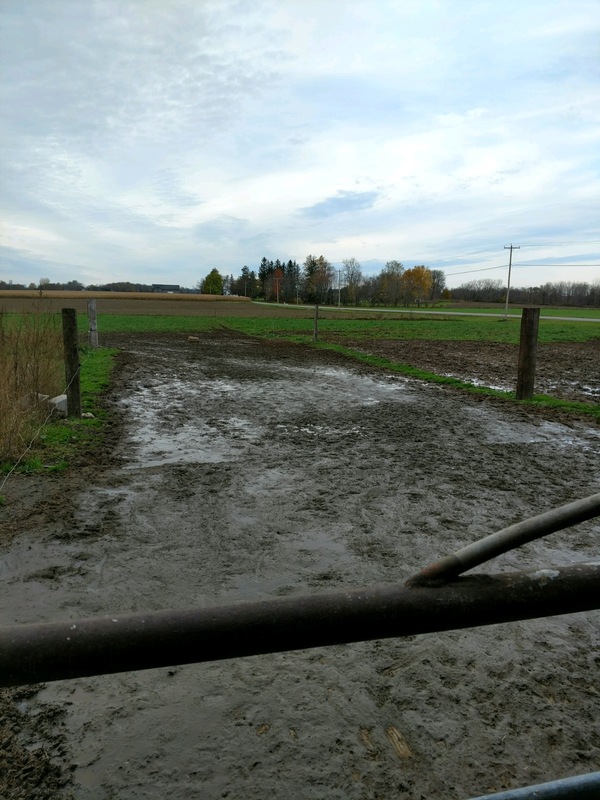 The parts of the pasture that aren’t under water are all mud. The mud is terrible for our feet. (We can visit with the nice man who gives us our pedicures another time and discuss feet issues.) But in short, it can cause our feet to rot. 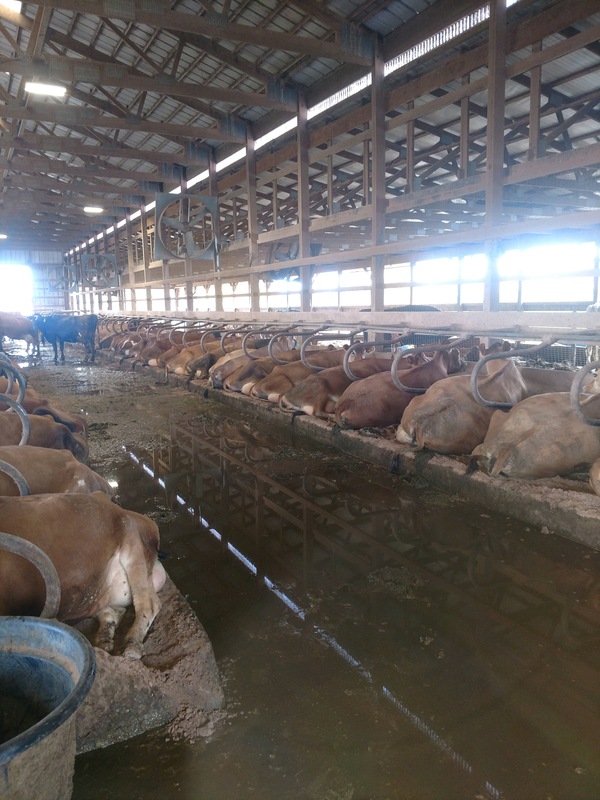 Along with the fact that if a cow was to lie down in the mud or all that water, she could get mastitis from the bacteria. In the barn, the stalls are kept nice and clean so that doesn’t happen. This is the view from in the barn going out to our pasture. You can see all that mud! Yuck! I know some people don’t think it’s fair that a cow is stuck inside. Our cows have access to pasture starting in April or May, depending on what kind of spring we have, and are normally in for the winter in October. But it’s not all our farmers choice. Like I said, cows don’t like rain! If they are outside when it starts raining it is quite a site to see! The whole herd will high-tail it (literally-they run with their tails stuck straight up in the air) as fast as they can. Almost like they were playing “last one in is a rotten egg”. My farmer was telling me how the gates were open the other day and it wasn’t raining but there was only one cow outside! Just one! It gets to be this time of year and the girls just like to start hunkering down. What about other weather? Well, any guesses on what is the ideal temperature for cows? I know my farmer mom likes the house around 70…and she says she sneaks and turns the thermostat up sometimes when my farmer dad isn’t looking. But the big cows are really comfortable around 50 degrees. So in the heat of the summer, although they have access to outside, many choose only to go out for a short period of time. The heat can be really stressful to us, and in the barn we are in the shade with huge barn fans going to keep us nice and cool. Wind is also hard on us cows. Most of our wind comes from the North or West so all of our calf hutches and the main open areas of the barn face South. This works great most of the time for keeping us out of the wind, except for this weekend when the wind changed and came out of the South. Yuck. The changing weather and wind can cause pneumonia in the cows, but us calves being so young are the most susceptible. Our farmer knows what to look for and checks us all very closely and makes sure we stay healthy. What other season is left…oh yea…winter…I have been warned about winter and how evil it is. 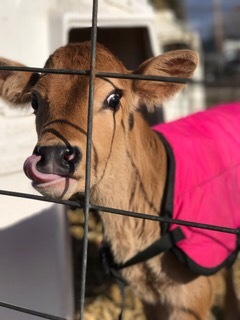 My farmer mom hates winter and being cold so she likes to baby us calves and make sure we are all warm and comfortable. The big cows don’t mind the cold as much as us young ones. As long as they are out of wind and are dry they can handle the cold a lot better. I think that about covers the weather. Hope you all are staying dry too! I know. I’m pretty darn adorable. You can see in the picture that I have a pretty pink jacket on. That’s because it’s starting to get a little chilly at night and the jacket keeps me nice and warm. My older sister told me that if I was born in the winter sometimes the humans will add a sweatshirt or throw a towel in the dryer and then tuck it under the jacket so it’s nice and warm. 1) All the cows calve(or give birth) in a part of the barn that’s full of nice fluffy straw that gets cleaned regularly. However, I am just a baby so there’s no guarantee that in my wobbling around I won’t end up lying in a pile of poop. I’m just like a human baby in that I can get infections really easily through my umbilical cord, and lying in poop would be bad. 2) There’s a lot of room in the barn but sometimes the cows like to play. It is very, very easy for me being so little and wobbly to get stepped on. You can imagine me being a 60 pound calf getting stepped on by a 1200 lb cow could cause some serious damage. It could even be fatal. 3) It’s really crucial for me to get colostrum within a few hours of being born. The colostrum contains antibodies that help me stay healthy, especially those first few days when I’m so vulnerable. 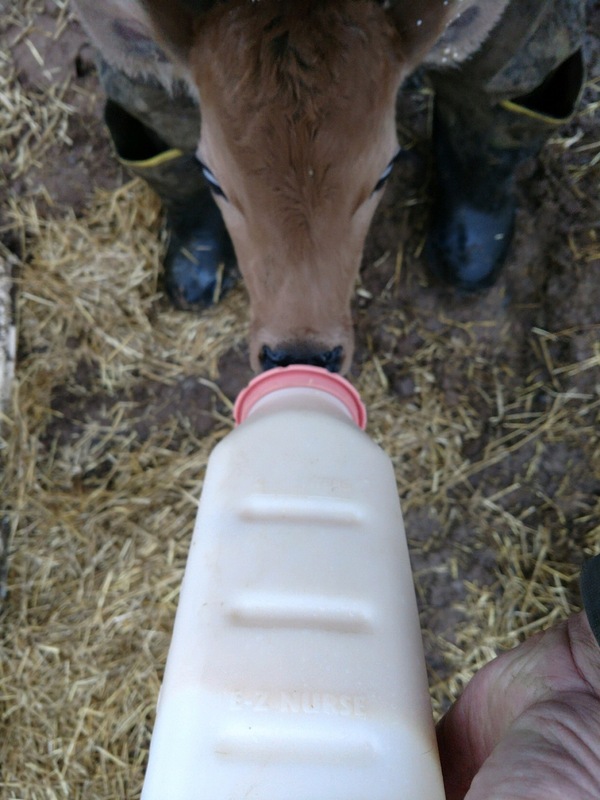 My humans can milk my mom and then bottle feed me the colostrum to make sure I get enough. Sometimes a cow may not have enough and they will supplement with either a replacer or another cows colostrum. They even have this neat tool called a refractometer which basically can measure the immunoglobulin level to make sure I have what I need. If I was to just drink off my mom instead of being bottle fed, I may not get enough or it may be poor quality. 4) When I’m living in a hutch, my house and always be kept clean and dry. My intake can be measured and I get checked over 2 to3 times a day to make sure I look healthy. My humans get to know me and if I don’t feel good, they can tell right away and help to get me feeling better. 5)Sometimes babies not being with their moms is what’s best for the cow. Sometimes a cow may need assistance calving and just like humans, may be tired after and not feel like drying me off(that would make me sick come winter!!) Sometimes a cow may leave their baby to go eat, or some really want nothing to do with their baby. Some are really good moms and won’t leave their baby at all, even to eat, which can make them sick. I didn’t mind going to live in my house. My mom was upset for a few minutes but once she started eating, she forgot all about it. My human mom doesn’t like having to separate us, since she also has a baby, but she knows it is the best thing for everyone. And she loooooves to give us babies attention. My human dad says she spoils us and turns us all into pets, but I don’t see anything wrong with that. I’ve told you a little about me and where I live and why, I’ll quick tell you about my human family and then it’s nap time!! I have a dad and mom and a 8 month old baby brother. He is pretty cute. Mom says he’s been a little cranky lately since he’s finally getting his teeth in! She said he decided to get both bottom ones in at the same time!! My humans also have a pet goat, sheep, pig and donkey. It’s kind of like a book. They also have a few cats and dogs. 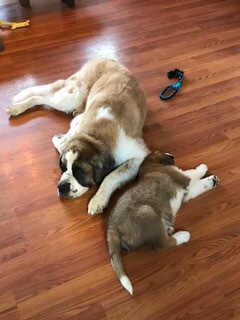 They just got a new puppy-a Saint Bernard named Gus. He is about as cute as they come!!! Here he is with his older brother. Like I said, it’s definitely nap time now. 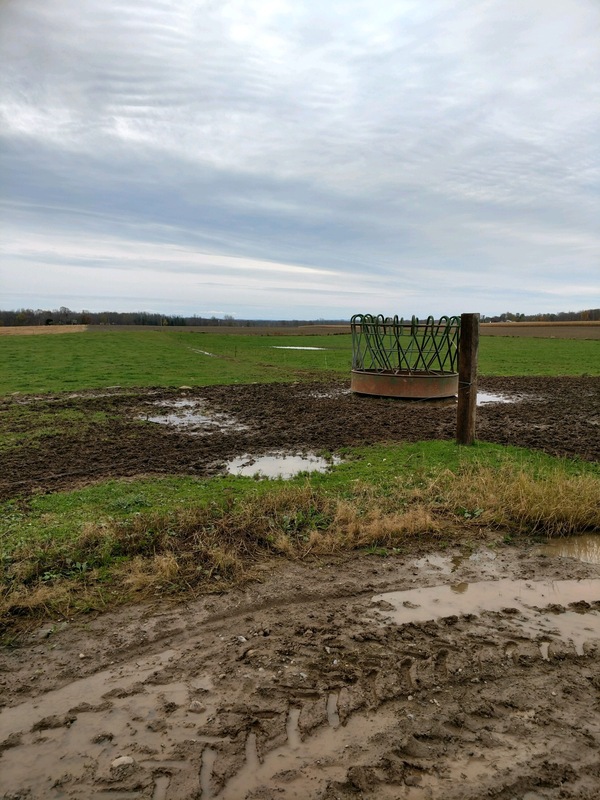 I hope you enjoyed my story and follow along as I tell you more about me and my farm! !